<1>Latest release of the WindFire hunting light product S10 Red LED hunting lights are brighter and farther than any hunting lights, the best hunting lights on the market and an indispensable tool for hunting at night . Equipped with three premium Cree XP-E2 Red color LEDs, this long range hunting spotlight emits 650 LED lumens and reaches 300 yards, enabling you to spot games much easier and earlier and target more precisely. <2>Night hunting can be fun and effective but it is challenging to find the target. Human's eyes are sensitive to the Red range of light, but animals are not spooked by a Red light, so Red hunting light is very helpful to find the games in the dark, most of the hunting games like hogs, coyotes, fox or other varmints, are less sensitive to the Red light so you can find the game and aim at the target without alerting them. 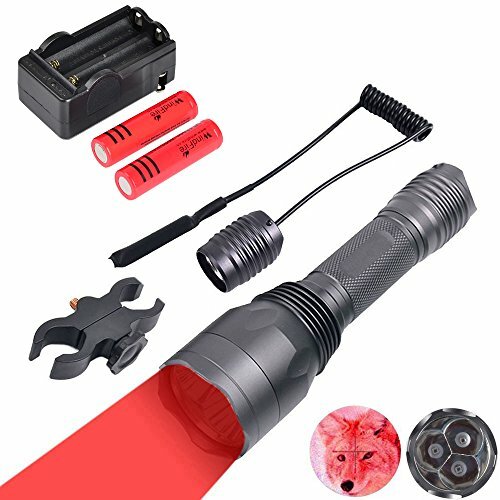 <3>The light comes with complete recharge kit with one of high performance rechargeable battery and a smart charger. .
Sizes: length 6.2", head diameter 1.75", body diameter 1.05"
Super bright Red hunting flashlight, featuring 3 pcs the latest XP-E2 Red LED,Single mode Red light design easy to use, focused Red beam that helps you find your game in the distance without disturbing them. Aviation-grade aluminum with matte anodized resistant to strong impacts and scratches,highly durable and reliable,daily waterproof,works in heavy rain.